This piece is based on original research that was presented last month at the Society for American Baseball Research’s 48th annual national convention. Last winter I wrote an article on Matty Alou and Manny Mota, focusing on the three years (1966-1968) during which they formed a center field platoon for the Pittsburgh Pirates. You can read the story here, but the short version is that they were good friends (growing up some 10 miles from each other in the Dominican), who were born in 1937, signed with the Giants in 1957, were natural center fielders blocked by the best center fielder who ever lived, and eventually found themselves together again with the Pirates in 1966. They were also remarkably similar players – free swingers with very little power, who, in the offense-starved 1960s, could be valuable if they could hit .300. In 1966, they did just that – Alou hit .342, and won the National League batting title, while Mota hit .332 and would have finished second had he had enough plate appearances to qualify. Please forgive the use of old-school statistics here, but their batting averages are what made this a big story in 1966, the focus of national newspaper and magazine stories. Beyond their quality, what struck me about this platoon was how strictly Pirates manager Harry Walker adhered to it. When the Pirates faced a right-handed starter, Alou started 119 of 122 games. When the Pirates faced a lefty, Mota started 38 of 40 games. I define a Platoon Score as the percentage of games in which a two-person platoon was properly deployed. The Alou-Mota Platoon Score is 157/162, or (as a percentage) 97. I wondered how unusual this was, to employ a platoon in 97 percent of a team’s games? Had any platoon ever finished at 100 percent? To help answer these questions, I asked Retrosheet’s Tom Ruane to provide me some data and (as usual) he came through. Because Retrosheet’s lineup data go back to 1908, my study covers 1908-2017, 110 seasons. For the purposes of my study, I define a platoon as a two-person single-position job share in which a left-handed hitter starts against right-handed pitchers, and a right-handed hitter starts against left-handed pitchers. I am looking at starting lineups, so what happens the rest of the game does not matter. I am looking at positions in isolation, so I do not care what a player does on his day off – he might platoon at catcher but play center field on his “off” days. I allow a switch-hitter to hold down one half of a platoon – his starts against the “other” handed pitchers would not count as complying with the platoon. A Perfect Platoon is a platoon that achieves a perfect score – the two players are properly platooned for every game the entire season. A Full Time Platoon requires a Platoon Score of 80, and further requires that each half of the platoon is employed in 80 percent of the appropriate games. Let me explain the last requirement with an example. The 1956 Dodgers, with their legendary lineup mostly filled with right-handed hitters, faced a right-handed starter in 140 of 154 games, with Duke Snider (their lone left-handed-hitting regular) getting the call 137 times. In the 14 games the Dodgers faced a lefty, Carl Furillo happened to start three times. The Snider-Furillo pair therefore had a Platoon Score of 140/154, or 91. This was obviously not a platoon; this was just Snider getting a day off once in a while. Using my modification, Furillo would have had to start 11 of the 14 games against left-handers, which I suggest would have been recognized as a platoon, albeit an unbalanced one. As you know, the left-handed-hitting half of a platoon will get most of the starts, usually between 65 and 75 percent. As it turns out, there has been quite a bit of variance over the years. 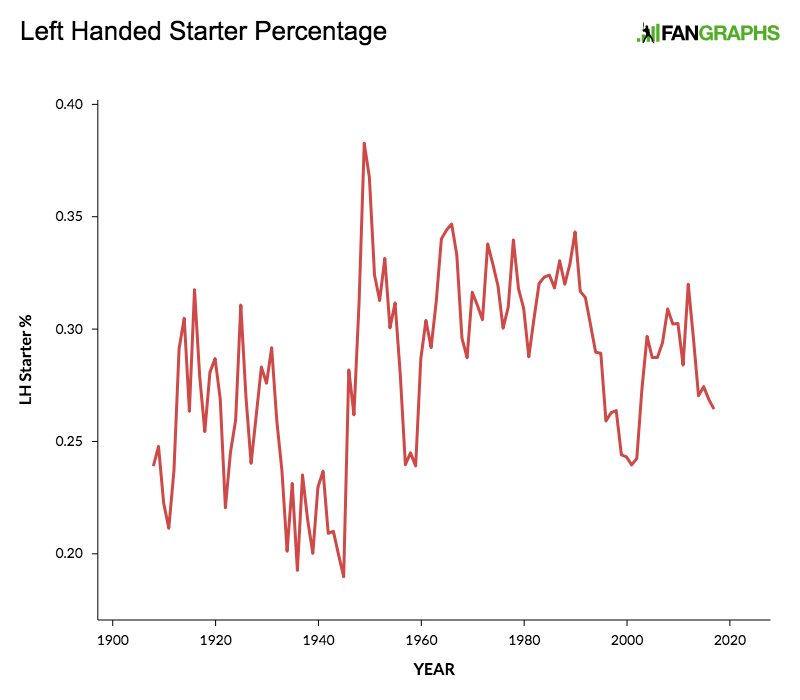 Years ago there was quite a bit of variance among teams – the 1950s Dodgers rarely saw a left-handed starter, while the 1949 Cardinals (which featured Stan Musial and Enos Slaughter) saw a lefty starter in 60 percent of their games. Today, teams rarely move their starters around based on the opponent, so platoons tend to have more predictable balance. Has there ever been a Perfect Platoon? No, as it happens. In fact, only three times in major league history has a team had the platoon advantage every game at a position without the use of a switch-hitter, but all of these involved more than two players. As I am looking for a two-person platoon, none of these job shares qualify as perfect. Lowering the bar, how about a Full-time Platoon, with two players playing 80 percent of the games against the appropriate starters? Since 1908, there have been 136 Full Time Platoons in 108 seasons, a little more than one a year. What elements do you need to maintain a qualifying platoon? The manager has to have the confidence to commit to the platoon early and stick with it. Both players need to remain healthy and effective. Alou and Mota each got banged up and missed a couple of games, but nothing serious, and obviously they played well. The players at other potential landing spots need to play well also. In the Pirates case, left fielder Willie Stargell and right fielder Roberto Clemente had outstanding seasons – both easily outhit the center fielders – so Harry Walker had no obvious place to move Alou or Mota. You need a large enough roster. Teams today generally have three or four players on the bench, making roster construction much more difficult than it used to be. For these 136 Full Time Platoons, what positions were most often involved? The most common platoon position has been catcher, which makes some sense. Catcher is the one position where the starter cannot player every day, so if you find a left-handed-hitting catcher who can hit, he would start about 110-120 games. Catchers have qualified 37 times in this study. Philadelphia platooned catchers Smoky Burgess and Stan Lopata for three straight years starting in 1952. They were the first pair to qualify for three years, a feat not matched again for another 30 years. 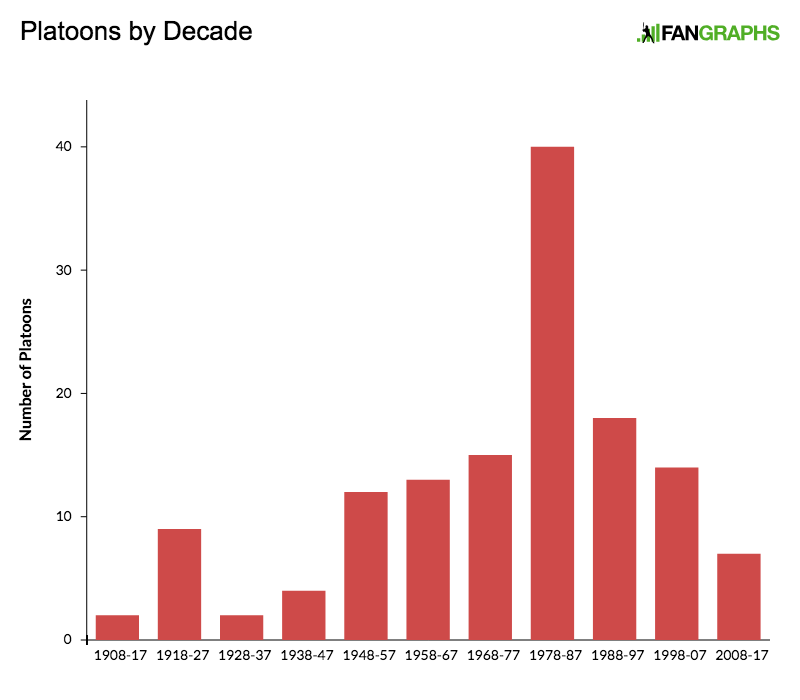 What era has had the most platoons? The use of platoons gradually increased after World War II, before exploding in the late 1970s for a decade, and then slowly receding again. The first platoon (my data start in 1908) came in 1909 with Tigers catchers Boss Schmidt and Oscar Stanage. 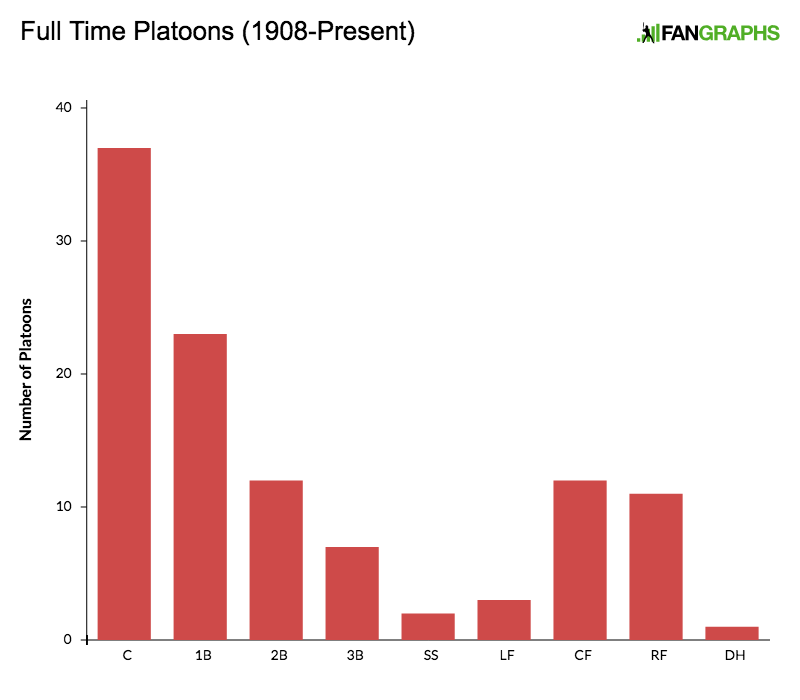 What managers have used Full Time Platoons the most often? Tris Speaker stands out here because he platooned when no one else was doing it. In fact, his platoons represent five of the first 10 qualifiers. Bobby Cox is most famous for his long successful run with the Braves in the 1990s and 2000s, but most of his platooning was done when he managed the Blue Jays for four years in the early 1980s. This stint included the two longest duration platoons in big league history. Mulliniks and Iorg platooned for Cox’s entire tenure in Toronto. Whitt and Martinez nearly did the same – in 1985 they had a perfect score until July 9, when Martinez broke his leg on a collision at home plate with the Mariners’ Phil Bradley. Martinez missed the rest of the season, but returned the next year to qualify with Whitt again, albeit now playing for manager Jimy Williams. Remarkably, Cox employed three platoons in 1984. In reality, Bell was a full-time player – he played the rest of the time in right field, sharing the job with Jesse Barfield. In effect Collins platooned with Barfield, but my somewhat arbitrary definition considers the positions independently, and sees the platoon in left field but not in right field (because both Bell and Barfield were right-handed hitters). The Blue Jays were a good team throughout his period, making all of this platooning a matter of discussion during national TV broadcasts and in newspapers. The best player who was ever part of a Full Time Platoon was undoubtedly Stan Musial, who platooned with Chuck Diering in center field for the 1949 Cardinals. The Cards faced a right-handed starter 69 times, and Musial started in center 68 of those. When they faced a lefty, Musial started every day in right field. If you wish to say this is bogus, that it was actually the other guys (Chuck Diering and Ron Northey) who were platooning, I will accept your logic. Musial’s involvement seems historically interesting and is consistent with my definition. Musial aside, there have been four other Full Time Platoons involving a future Hall of Famer, and all of them are interesting in their own way. 1965 Reds first base: Gordy Coleman and Tony Perez. Perez was at the very start of his career, and got the short half of this job share. 1982 Red Sox designated hitter: Carl Yastrzemski and Tony Perez. Two Hall of Famers, both in their early 40s, and both still hit enough to deserve roles. 1985 Reds first base: Pete Rose (age 44) and Tony Perez (43). Perez again, this time platooning with his own manager, who was going after Ty Cobb’s hit record. Kudos to Rose, who stuck with the platoon and never once started himself against a left-hander. 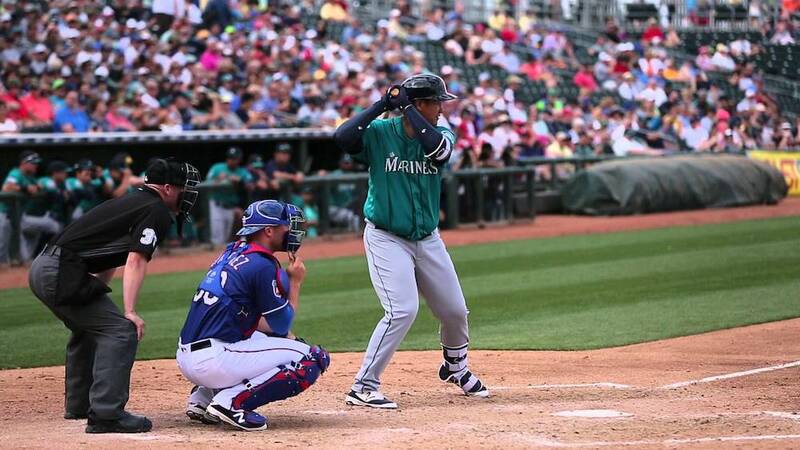 2009 Mariners designated hitter: Ken Griffey Jr. and Mike Sweeney. Near the end of Junior’s long, sad decline. I mentioned earlier that no pair of players had ever pulled off the Perfect Platoon. So, who came the closest? Three pairs fell two games short of perfection. 1972 Phillies second base: Denny Doyle and Terry Harmon. On July 1, Harmon played against a right-hander, and on September 30, Mike Schmidt (a few weeks into his career) got a start at second for the only time in his career. 1979 Twins second base: Rob Wilfong and Bob Randall. On two occasions, both in August, manager Gene Mauch started Wilfong against a left-hander. Wilfong out-OPS’d Randall 810 to 580, but Mauch was otherwise loyal to the plan. 1983 Blue Jays catcher: Ernie Whitt and Buck Martinez. Martinez twice started against a right-handed pitcher. I want to close by circling back to the pair that got me here – Matty Alou and Manny Mota. Mota had actually platooned with Bill Virdon in 1965, but when Virdon retired after the season the Pirates acquired Alou from the Giants. Alou had been a fifth outfielder with his career in doubt, hitting a hollow .231 when he got on the field. In 1966 the Pirates center fielders as a whole (almost entirely the platoon) hit .341 with a 121 OPS+, and the Pirates arguably gave ground only to the Giants (Willie Mays) at the position. In 1967, the Pirates center fielders (the same platoon) hit .346 with a 130 OPS+. Of all the Full Time Platoons in history, this is still the gold standard, teaming up for multiple years to form something like a star player performance. In 1968 the platoon finally ended late in the year when manager Larry Shepard began playing Mota in left field to spell a struggling Stargell, making Alou more of a full-time player. Alou hit .332, losing the batting title to Pete Rose on the final day of the season. After the 1968 season Mota was lost in the expansion draft, and Alou played 161 games. How’d he do with the increased workload? Just fine, thanks: .332, leading the league with 231 hits and 41 doubles, while setting an all-time record (since broken) of 698 at-bats. Maybe he just needed to platoon for a few years to be successful? Platoons are not dead, though they are much harder to pull off. You need the players, but you also need the rest of your position players to create a somewhat stable roster. 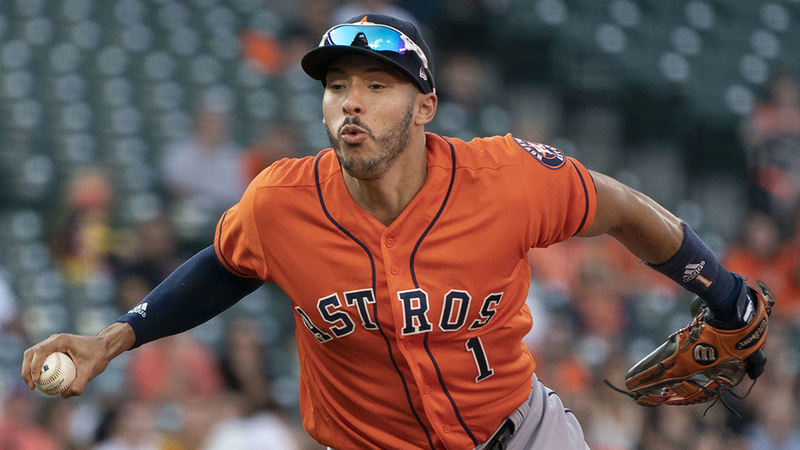 Unless there are changes to the roster rules, platoons will remain a rare, but welcome, part of the game. When I spoke on this topic at the recent SABR conference, the questions were almost entirely questions about whether some pair of players qualified. With that in mind, I leave you with a link to a the entire list, presented in chronological order. Mark Armour was the founder and long-time director of SABR's Baseball Biography Project and the author or co-author of several books on a variety of baseball subjects. He lives with his family in Oregon's Willamette Valley. I have not crunched the numbers but I remember Any Etchebarren and Elrod Hendricks of the Orioles’ powerhouse teams of the late ’60’s and early ’70’s being platooned almost regularly at catcher. I am surprised Earl Weaver did not make the list. Along with Etchebarren/Hedndricks, he platooned Al Bumbry and Ken Singleton in the mid to late ’70’s, at least that is what I remember off the top of my head and without benefit of a complete cup of coffee this morning. Weaver generally had a third catcher (Clay Dalrymple, Johnny Oates) which caused the Hendricks/Etchebarren platoon to fall short. In the late 1970s, as you say, he platooned his outfielders a lot. But he had so many combinations (plus the DH spot) that no pair of players ever truly grabbed one position. And then there was the 1982 Orioles LF platoon of John Lowenstein, Gary Roenicke, and Benny Ayala. Player X was that year’s NL MVP, Dale Murphy. Mark, heard your presentation in Pittsburgh, and this was just as good the second time around. Only have a few recent years done (2016-2017 and 2011-2013) but I am very interested to see how the trends have changed over time. In my view, you have to look at platoon stats to put players in proper perspective. For some guys, it makes no difference, but for others like Fred Lynn, he’s two different ballplayers in one. Great article as always from one of the smartest minds out there. Fascinating and interesting. Was expecting to find Casey Stengel on the managers list. I’ve read so often that he was a pioneer of platooning with those great Yankee teams, it’s disappointment not to find the data back that up. But that’s what good research often does…exposes the myths. Tremendous article. One note: Garth Iorg, not Dane. Darn — they were brothers! Rance Mulliniks and Dane Iorg are the greatest name platoon in baseball history. McCovey’s early years were a bit of a mess — he was sent the minors one year — and he sometimes would play full time for a while and then be benched completely. To meet my criteria, you have to platoon from April through September, and you have to have a dedicated platoon partner. The Giants had MANY outfielders they were shuttling through left field. The Blue Jays usually platooned at DH, but it was never the same two guys for very long. The year Orta/Johnson shared the job (1983), Johnson got all the starts against LHP, but he and Orta split the RHP starts. Which is why Johnson ended up starting 97 times (the RHH would be around 50 in a strict platoon). The next year it was Johnson/Aikens, then Burroughs/Oliver/Johnson, etc. I am looking for two-person platoons that go April to September. Nice job. You can’t lose if the article mentions Rance Mulliniks. I was looking for a late 80’s Blue Jays McGriff/Fielder platoon, but I guess they fell short. By this measure, the Cardinals have only had two qualified platoons over the years. Both were in 1949. I guess Eddie Dyer went through a phase.